UT-Austin Nobel Laureate Steven Weinberg has emerged as a leader, albeit a reluctant one, for faculty who oppose allowing guns in their classrooms after saying he will try to prevent students who want to carry handguns from taking his courses. 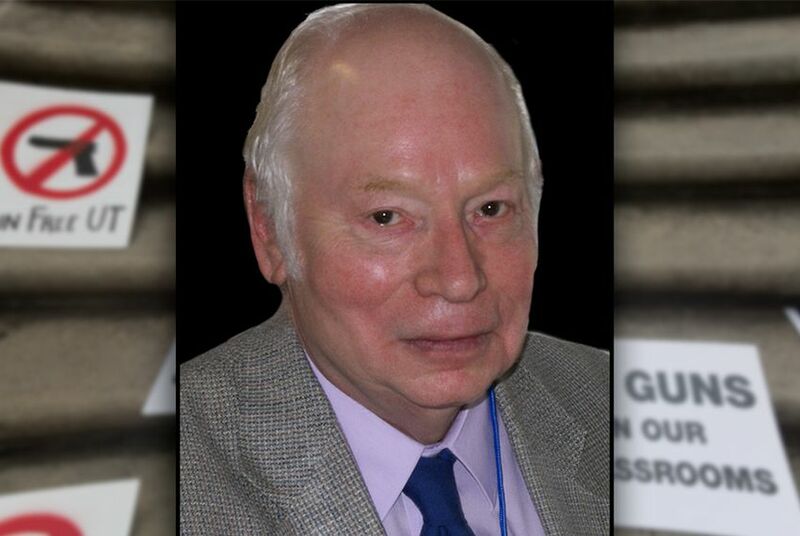 Nobel Prize-Winning physicist Steven Weinberg told the Faculty Council at the University of Texas at Austin that he will attempt to ban guns from his classroom this fall, regardless of UT's policy. Since emerging as a reluctant leader for University of Texas at Austin faculty who don't want guns in their classrooms, Nobel Laureate Steven Weinberg has received an outpouring of support from his colleagues, parents of UT students and even waiters at a campus restaurant, he says. On Monday, the 82-year old physicist rose at a Faculty Council meeting to announce that he will not allow concealed handguns in his classes despite a new law allowing license holders to carry concealed weapons on campuses. The campus carry law passed in 2015, which takes effect Aug. 1, allows public university presidents to draw up their own rules governing concealed weapons on campus, and allows them to bar weapons in select areas. But the law's supporters say they did not intend for guns to be barred from classrooms. Attorney General Ken Paxton issued an opinion in December indicating that a classroom ban would violate the law, and the bill’s author, state Sen. Brian Birdwell, R-Granbury, voiced concerns that a classroom ban would defeat the purpose of the legislation. A campus-carry task force at UT issued recommendations for gun-free zones to President Gregory Fenves in December, calling for him to ban guns in dorms, at sporting events and in certain scientific laboratories. The report did not include a suggested ban on guns in classrooms, despite vocal protests by some professors. Weinberg said he wrote a letter to Fenves in December, urging him to consider instituting a classroom ban. In the letter, he told Fenves about his intentions to bar handguns from his classroom either way. Weinberg said he “would rather not be in the position of violating university regulations,” but said he will stand by his decision if faced with a lawsuit from an angry student, or even one from the state. He said he has not considered pursuing legal action of his own against the university if he is forced to allow guns, although he said he has considered a different solution. Weinberg won the Nobel Prize in Physics in 1979, and is the only Nobel Prize winner currently employed at UT. He said he typically teaches one upper-level undergraduate class each semester. This spring, he is teaching an astrophysics course with 25 students. “Students who haven’t learned calculus are not welcome in my astrophysics class because they’re not able to keep up with the level of the material,” he said. “Their presence, if I had to keep explaining the fundamentals of calculus to them, it would really get in the way of my teaching. I think I have the right to exclude anyone whose presence would get in the way of my teaching. I’m nervous enough about guns, so that would get in the way of my teaching." In addition to a safety concern, Weinberg said he anticipates a heightened challenge when it comes to recruiting faculty and students to Texas – particularly in the physics and astronomy departments. "There is this whole galaxy of great universities on the East coast and then in California," he said. "We're way out of that concentration of talent geographically and there's nothing that can be done about that, it makes recruiting hard. And then to add to it, this less-favorable side of the Texas image – guns in the classroom? I think it will make it doubly hard." On Tuesday, members of the Senate State Affairs Committee questioned UT System Chancellor William McRaven on how he plans to deal with professors who do not follow the law, without mentioning Weinberg by name. McRaven said members of his universities’ leadership will meet with faculty members to discuss the issue. Ruben Cardenas, a UT-Austin government and political communications senior, said Weinberg’s remarks sparked conversations on campus, but said he did not like his approach.